The Queen has personally thanked the British servicemen who helped in the battle to free Europe from Nazi control on D-Day 60 years ago. "I take it upon myself to express the immense debt of gratitude we owe to you all," she told a gathering of British veterans on Sunday evening. The men had proudly marched past her in Arromanches as the weekend's D-Day events drew to a close. Earlier, the Queen said she saluted all the "courageous" Allied troops. Speaking at Juno Beach earlier on Sunday, she remembered the 14,000 Canadians who fought alongside British and US servicemen. She called the 1944 invasion of France "one of the most dramatic military operations in history". She later joined French President Jacques Chirac for a ceremony at the Commonwealth war cemetery in Bayeux. And she attended the main international ceremony at Arromanches - the centre point of Sunday's D-Day commemorations. "It would have been difficult enough for a single nation to plan and execute such an enterprise," the Queen said on Juno Beach. "For a group of allies with little previous experience in co-operation, it was a major triumph." Later at a British-French service in Bayeux - the first French town of importance to be liberated - the Queen along with Mr Chirac and Prime Minister Tony Blair, paid tribute to the thousands killed in battle. The town is home to France's largest Commonwealth war cemetery of WWII, with more than 4,200 graves. The nearby Bayeux Memorial commemorates the death of another 1,801 men. Both the Queen and Mr Blair took time to meet former soldiers, sailors and airmen. Following a march-past in the town of Arromanches, the Queen said it was sad this would be the final parade in Normandy of the Normandy Veterans' Association. "It must not be forgotten that the members of the Association continue to care for one another," she added. As the weekend's events drew to a close she said: "There is just one thing more I want to say. "What for you is a haunting memory of danger and sacrifice one summer long ago is for your country, and for generations of your countrymen to come, one of the proudest moments in our long national history." "I salute you and thank you on behalf of our whole nation." 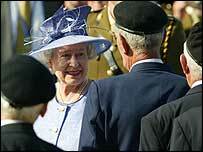 Mr Blair and US President George Bush were among at least 17 national leaders to join the Queen in France. For those unable to make the journey to France, there was a memorial service at the National Memorial Arboretum, in Alrewas, Staffordshire, attended by hundreds of veterans. "There was the symbolic rewarding of 14 medals, representing the countries involved in the D-Day landings"